Which island are you from? she asked me curiously. She was 30, wrapped up in a red hijab, sitting under a palm tree on the white sand beach, casually de-seeding wild almonds. India, I replied with a smile. I asked her about the island that was her home now (the one we were both on), and spent a lazy afternoon chatting about the one she was born on, the one where her husband ran a bakery and others in the Maldives she had been to or heard about. Just as I was leaving, she asked: Which island in India are you from? Living far out in the Indian Ocean, surrounded by water and sand everywhere, even I forgot for a while that there is a world where people don’t live on islands! First glimpse of the Maldives from the flight window! A couple of months ago, when GoAir reached out to me regarding their new direct flights from Bangalore, Mumbai and Delhi to Male – the capital of the Maldives (and to Phuket in Thailand), I knew I had to write this post. As it becomes easier and cheaper to access one world from another, this is our chance to truly experience local island life in the Maldives – and its fascinating culture, cuisine and underwater world, in a fulfilling yet responsible way. Locals who quickly became friends! Before I spent 2 weeks living out my castaway island dream on a small “local island” in the Maldives, I imagined that all people ever did there was lounge around on the perfect blue water- white sand beach – like in the pretty photos we see in travel magazines and on Instagram! But unlike “resort islands” where most visitors end up staying, the Maldives has designated local islands where the Maldivian people actually live – traditionally in houses made of corals with woven coconut rooftops – work, go to school, chill by the azure ocean and have plenty of occasions to celebrate. On my tiny local island of Maalhos in the Baa Atoll, women worked under the coconut trees to weave coconut leaves for rooftops; men commuted by the public ferry every morning to work on resort islands; schools girls clad in black hijabs trained at the volleyball court in the evenings; Thursdays were for beach cleaning and Fridays for afternoon prayers. By night, under the stars, half the island was out on the communal jollies – handwoven lounging chairs, somewhat like a hammock – discussing the day’s affairs and playing local drums, with the gentle waves of the Indian Ocean creating soothing music in the background. 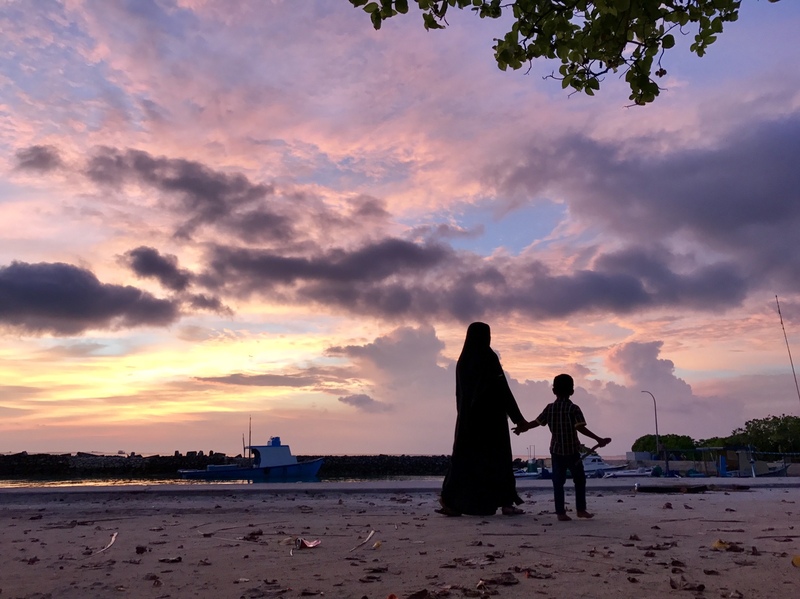 Evening vibes in Maalhos (and a jolly to chill). One weekend, we got invited, along with the rest of the island, to a local celebration, where a Maldivian band came by boat from the neighbouring Raa Atoll to perform Divehi music all night long! Another weekend, we found ourselves invited to a local wedding celebration. During our stay, ten O-level students on the island graduated… and where do you go for your graduation socials when you live in the Maldives? To an uninhabited island in the Indian Ocean, of course! Tip: We stayed at Madi Finolhu guesthouse on Maalhos island in the Baa Atoll and absolutely loved it. To get there, take a direct flight from Mumbai, Delhi or Bangalore to Male on GoAir, then a public ferry and a private boat transfer to Maalhos. Life on a local island in the Maldives. So, here’s the thing: There are two ways to experience the Maldives. You can stay on a “resort island” – a fancy resort on a private island. Pay through your nose, experience luxury which is mostly environmentally unsustainable, see only fellow tourists and walk along a sanitised beach without shells, coconuts and the occasional waste, surreptitiously cleared away by resort staff every morning. You can soak in the beauty of the islands, but perhaps in a bubble with no sense of how the locals really live. You could be anywhere in the world – the Maldives or other islands like Mauritius, Seychelles, Andaman or the Caribbean. But it’s only on a local island that you can get a real flavour of Maldivian life. Witness kids of all ages in their playground – the beach – surfing on their tiny boards. Learn that although the women are expected to cover up fully and wear an abaya at all times, they cycle or play sports in the evenings, hang out on the public beach under the stars and love Bollywood music. Join men as they play local tunes and chat about the island’s affairs. Alcohol is forbidden on local islands, but amid the refreshing sea breeze, fresh mango juices and laid-back life, I hardly missed it. Tip: When you stay in a local guesthouse on a local island, the money you spend goes directly to the locals – and you can influence them to be more aware of their environmental impact. All the incredible Maldivian food we devoured. Before I got to Maalhos, I was quite worried about surviving as a vegan there. After all, I could walk from end to end of the island in 20 minutes and I imagined all people ever ate was seafood. I was pleasantly surprised to learn that SO many interesting vegetables and fruits grew on our island – green papaya, brinjal, kopifai (a leaf deliciously made into a salad), wild almonds, pumpkin, mangoes, pineapple, passion fruit and my favourite – moringa, the superfood! At the local-run Madi Finolhu Guesthouse, I feasted on different kinds of veggies and curries, along with roshi (a local bread a bit like India’s roomali roti) and fresh passion fruit or mango juices every day. When I explained to locals that I love fish in the ocean but not on my plate, they laughed at first, then nodded solemnly about how the local fish population has been declining. On the other hand, most resorts in the Maldives serve up a wide variety of cuisines, air-flown from different corners of the globe, with little care for local ingredients and sustainability. Tip: Check out my food adventures in the Maldives and around the world on my food Instagram account @nomadicvegan. Inform your accommodation beforehand about your vegan diet, so they can make sure you’re well fed. Exploring an uninhabited island in the Maldives. Instead of snorkeling and water tours offered by most resorts, staying on a local island meant we’d hitch a ride to snorkel off an uninhabited island when our host at Madi Finolhu was on his way to work. On his fishing boat, we’d go to virtually unknown spots in the Indian Ocean to snorkel above the most stunning corals, look for Manta Rays at their cleaning stations, come face-to-face with a black tip shark, observe in fascination a green turtle who would come to the surface every few minutes for a breath of air, and most unexpectedly, spot a large humpback whale presumably migrating via the Maldives – secretly hoping it wouldn’t topple our little boat! Tip: No matter who you’re out exploring the ocean with, remember NOT to touch or feed any wild marine animals or get too close to the corals. The world’s climate change “school”. Fascinating though it was to explore the depths of the Indian Ocean with a local islander, it also put in perspective how much our oceans are changing. Our host lamented how many patches of stunning corals have been bleached in the past few years due to the warming climate and increasing plastic trash – the effect of which is very obvious on Maalhos. That inspired him to lead an initiative in his past role as the island councilor to start a waste management program on Maalhos. Each house on the island now segregates waste; organic waste is composted, tin and plastic are compressed and sent to Male, some inorganic waste is burnt but they’re on the lookout for better solutions. Maalhos is also in the midst of finishing up their own tiny desalination plant with a glass bottle facility – so locals no longer have to rely on boiled rainwater or plastic bottled water for drinking! With our awesome host, Matheen. I heard some sad stories of fancy resorts that pay neighbouring local islands to take their waste, so they can put up a clean facade for tourists. And of uninhabited islands where trash has been piling up for years – and presumably drifting into the ocean. As travellers, the islands of the Maldives are classrooms to learn about climate change and the plastic menace first hand – and realise how our travel and consumption choices can have a direct impact on how we choose to experience a destination. Tip: Please do your bit and opt to drink filtered / boiled rainwater in the Maldives like the locals. Carry a LifeStraw filter or bottle if you must. Say no to single-use plastic like straws and bags; carry your own bamboo straw and reusable cloth bag. Make sure you carry all your plastic trash back to a city with waste management in place; don’t dispose it on the island where it will either be burnt or harm the underwater world. Budget is a relative term in the Maldives. Even the most basic resorts charge upward of 500-1000$ per night. In comparison, 60-150$ a night at Madi Finolhu (room only to full board) felt like a steal. To be honest, despite receiving invites to stay at fancy resorts with no responsible tourism policy in place, I’d much rather stay on a local island. I mean, we were among a very small handful of travellers on our pristine, beautiful island; large stretches of the empty white sand beach were ours alone to be savoured; each sunset was unforgettable in its own way; we had private dinners on a moonlit beach under the stars; the magical underwater world was just off our beach, with eels, living corals and all kinds of fish; and many nights, while walking along the beach, we witnessed the surreal glow of the bio-luminescent plankton on the shore, mirroring the twinkling stars in the sky above! Do you dream of travelling to the Maldives someday? Note: I wrote this post as part of a campaign by GoAir – who now offer direct flights from India to Male and Phuket, as well as flight+hotel offers. As you know, opinions on this blog are always mine. Your post has definitely made me ponder on the assumptions about Maldives as bunch of luxury resorts on the many islands. The country is definitely a classroom for live demonstration of the effects of global warming and luxury tourism. It makes me sad when despite knowing the consequences of our actions, most of the tourists end up being a part of the problem. Your post, as always shows that there is a ray of hope in every corner of the world. Keep going on and on. So true Jatin. We have to keep looking for and sharing that ray of hope! I have thinking of doing Maldives just this way and I was discussing this with a friend just yesterday. And I was so glad to read this today morning. This is more real Maldives than those fancy resort pictures. Absolutely. Hope you make it there soon and love it too! What an amazing write and journey! Good one shivya. The responsibility you carry as a traveller without compromising comfort is appreciable. Thanks Malik; it’s something I’m forever trying to balance! Maldives will be in everyone’s travel list and can say it is a awesome post, as you explained every single point about what to experience and where to visit in Maldives. Thank you for the beautiful images. Thanks Gayatri; I hope more people will travel there more mindfully! I love reading travel blogs. As a free hand writer I have less time to travel around and visit places and find it very saddening. So I learn about new places and countries through travel blogs and itineraries. They always give me an insight into the world outside my writing works and projects awaiting deadlines. Thank You for such wonderful blogs and writings. So glad my blog could give you a glimpse of the world far away. I hope you’ll be able to save some funds soon and visit some of these places yourself! thank you for the wonderful images, looking so nice. It’s a beautiful part of the world! How did you find out about Madi Finolhu ? I think more people are opening up to this side of Maldives now. The fancy resorts are anyway out of budget for most. Great guide and guesthouse recommendation – bookmarking for the future. Thanks for this post. Until recently I thought the Maldives were completely out of my price range. It’s great that there are lower cost alternatives that also let you experience a bit of the real Maldives. I’ve done some research on Fulidhoo Island in the Vaavu Atoll and may add it on to an upcoming trip to Sri Lanka. Your post has got me very excited about this possibility. Maldives are on my bucketlist as well! That’s awesome Caroline! I love Sri Lanka too, the two together would be one epic trip. I totally thought I could never afford it, seems incredibly doable! I know, right? It’s great that they’ve finally opened up the local islands to tourism – so we can learn more about their way of life and our tourism money can directly benefit locals. For the last two years I’ve been wanting to visit maldives for our anniversary… I was shelving it everytime obviously because of the exhorbitant costs. After reading your post I still want to go there but with a while new perspective… This looks so much more beautiful real and like you said camca imagibe how much pollution and waste luxury tourism geberates. Shivya, thanks for this post! A the reason you’re one of the travel writers I suspect most is because you deeply care about sustainability and actually learning from the places you visit and don’t pay simple lip service. I know a few people who’ve been to the Maldives and stayed on the resort islands and it really didn’t appeal to me at all – in fact, I had some ethical issues with it. But your time there sounds amazing. I’m assuming people staying on the local islands also gives more money directly to locals? I imagine the resorts take a huge cut of the price and not a lot goes to the workers. What an amazing topic and your travel info. Previous PostUnusual Solo Travel Destinations to Feed Your Adventurous Spirit. Next PostHighs and Lows of 2018 – And Aspirations for 2019.